How a leader in Indian shipping helped deliver the message of Lord Chaitanya to the western world. In 1965 the Scindia Steam Navigation Company was one of the oldest, largest, and most respected shipping establishments in India. Its cargo consisted generally of food, clothing, farming equipment, and medical and educational supplies, which were packaged in boxes, cases, pallets, and barrels. In August of that same year, however, one of its cargo ships carried a passenger onboard, and he carried spiritual cargo that would change the world. 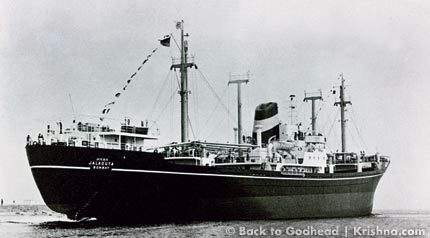 ISKCON devotees know the story well: During that fateful voyage from Calcutta to New York, the sole passenger cabin of the Jaladuta ("sea messenger") was occupied by His Divine Grace A. C. Bhaktivedanta Swami Prabhupada. At the time, he was a relatively unknown Vaishnava sannyasi. At age sixty-nine, he boarded the ship, tightly clasping his complimentary ticket. Prabhupada's followers know the story of how he procured that ticket, but details of the story have remained obscure. And for many devotees, the special soul who helped Prabhupada journey West is merely a name: Sumati Morarjee. In this article I'll explore the details of the story and further acquaint the Vaishnava world with the woman who played so vital a role in bringing Krishna consciousness to Western shores. While I've relied on Srila Prabhupada-lilamrita, by Satsvarupa Dasa Goswami, for much of what follows, I've also referred to additional material in a publication called Sumati Morarjee Felicitation Volume (Service to India Shipping), edited by N. G. Jog and published by Scindia House in 1970, which I discovered on a recent trip to India. Born into the wealthy family of Mathuradas Gokuldas and his wife, Premabai, in Bombay on March 13, 1909, Sumati was named Jamuna, after the sacred river associated with Krishna in Vrindavan. As it turns out, her destiny would involve other large bodies of water as well, since she would be the first woman in the world to manage a vast shipping concern. Although she had six highly qualified brothers, none of them would know the success that would fall upon their distinguished sister. As was the custom in India, while still a young girl she was betrothed to Shanti Kumar, the only son of Narottam Morarjee. Narottam had made a name for himself in the textile industry in Bombay and Sholapur, garnering untold riches for his offspring. Thus, Jamuna went from wealthy to wealthier. Since these were two of the most affluent and well-known families of the region, the marriage was among the biggest social events in Bombay. The festivities lasted more than a week, with newspapers covering its major processions, fireworks, and banquets for months to follow. Observing his daughter-in-law's keen wisdom and ingenuity, Narottam renamed her Sumati ("she of superior intellect"). She spoke Hindi, Marathi, and English and showed ability and interest in all facets of her father-in-law's business. When Narottam's wife died early on, Sumati became the lady of the extended household, gradually developing expertise in both domestic and business affairs. Sumati was deeply religious. Born into the Vallabha sampradaya (lineage) of Vaishnavism, she was a dedicated devotee of Sri Nathaji, a deity of Krishna popular in that line. She was also highly dedicated to the veneration of Tulasi, the plant incarnation of the gopi Vrinda Devi, who is among the greatest of Lord Krishna's eternal devotees. Later in life, even when she traveled abroad she would worship Tulasi daily, if only offering incense to a photograph. She was known among her peers as a balanced person who harmonized her deep spirituality with family and business. It was no surprise, therefore, when Narottam put her in charge of his fledgling shipping concern, inherited from his great-grandfather Jeevanji. An enterprising young man, Narottam eventually parlayed a few vessels into the Scindia Steam Navigation Company, which became the model for modern Indian shipping. Sumati built the company from humble beginnings and eventually even received praise from Mahatma Gandhi for it. Her relationship with the Mahatma, in fact, developed over the years, and she enjoyed a regular correspondence with him. Their exchange was documented in newspaper reports. He counted her among his closest friends. Established in 1919, Narottam's business was the first large-scale Indian-owned shipping company that catered to an exchange of goods between India and Europe. By the time the company sold off its fleet and ceased trading in the 1980s, it had ships sailing to the U.S.A., the U.K., Singapore, East Africa, Australia, New Zealand, and the Persian Gulf. 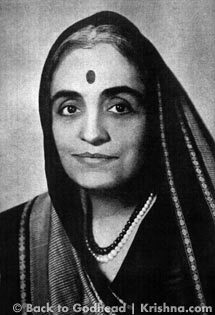 In 1946, just prior to Scindia's relationship with the United States, Sumati took full charge of the company, managing over six thousand people. She was already on the board of directors, and her rise to prominence had been just a matter of time. All involved knew her passion for the sea and her expertise in the shipping trade, developed over many years. In 1956 Sumati enjoyed the distinction of being elected president of the prestigious Indian National Steamship Owners' Association, an honor repeated during the next two years and again in 1965, just prior to Prabhupada's request that she send him to New York. These awards earned her independence as the sole decision maker over her ships. Sumati Morarjee first saw Srila Prabhupada in the 1950s at Kurukshetra, where Lord Krishna spoke the Bhagavad-gita. She later told an audience of his followers that he was sitting under a tree, chanting on beads. Sensing that he was a distinguished sadhu, she approached him, hoping to receive his blessings. At the time he hadn't yet taken sannyasa, the renounced order of life, and was thus still a married man. Nonetheless, she was impressed with his humility and devotion, and she mentioned this to him when they met again in Bombay. By that time Prabhupada was a swami asking her for help in getting to America. He had met a gentleman named Mr. Agarwal, a Mathura businessman, and had mentioned that he wanted to go to the West to fulfill the order of his spiritual master to preach the message of Lord Chaitanya in English. This meeting led to a sponsorship in America through Agarwal's son Gopal, an engineer in Pennsylvania. Soon Prabhupada received permission from the Ministry of External Affairs to travel to the U.S. Gopal Agarwal had solemnly declared that he would bear any and all expenses during Prabhupada's initial stay in the United States. Prabhupada then traveled to Bombay with a plan: He would seek assistance in getting to America by approaching Sumati Morarjee, who he had learned was head of the Scindia Steamship Line. After all, he had met her at Kurukshetra, and she had subsequently donated a considerable amount of money for printing Volume Two of his life's work, his translation, with commentary, of the Srimad-Bhagavatam. Concerned for his health and welfare, Sumati Morarjee declined to give him assistance. She feared that the lengthy journey by sea would kill him, since he was elderly and had never been outside India. Not one to be deterred from his goals, Prabhupada persuaded her secretary, Mr. Choksi, to speak up on his behalf, coaching him in exactly what to say: "I find this gentleman very inspired to go to the U.S.A. and preach Lord Krishna's message to the people there." But again she said no, determined in her decision to protect him in spite of himself. Prabhupada persistently demanded a personal interview, but it was not to be. Time passed. She ignored him, for his own good, she believed. Eventually, due to his tenacity, she acquiesced. When he entered her room, he simply said, "Please give me one ticket!" She could see the total commitment and longing in his eyes, his determination to please his spiritual master and to fulfill the desire of Lord Krishna. It was simply not possible to deny him, and so she scheduled a place for him on the ship Jaladuta, which was sailing from Calcutta on August 13, 1965. With deep concern in her heart, she saw to all his needs, making sure he would travel on a ship whose captain understood the needs of a Vaishnava vegetarian. Captain Arun Pandia made it a point to carry extra vegetables and fruits for the Swami onboard. A couple of days before setting sail, Prabhupada arrived in Calcutta, just to go to Mayapur and visit the samadhi (tomb) of his spiritual master, Srila Bhaktisiddhanta Sarasvati Thakura. He wanted to pray and to ask for his guru's blessings. Prabhupada was accompanied by several trunks, two hundred three-volume sets of his Srimad-Bhagavatam, First Canto, his personal baggage of a small suitcase, an umbrella, and a supply of dry cereal, in case he couldn't find suitable food in a land so far from home. Almost seventy years old, he would now embark on a journey and a mission that would be daunting for a man half his age. After ten days of travel, the ship approached the Red Sea, where Prabhupada encountered great difficulty. He noted in his diary: “Rain, seasickness, dizziness, headache, no appetite, vomiting.” The symptoms persisted, but it was more than seasickness. The pains in his chest made him think he would die at any moment. In two days he suffered two heart attacks. But he tolerated the difficulty, meditating on the purpose of his mission. One night Prabhupada had a dream. Lord Krishna and His incarnations were rowing a boat, and Krishna told Prabhupada that he should not fear, but should come along. Prabhupada felt assured of Lord Krishna’s protection, and the violent attacks did not recur. By September 10 Prabhupada was becoming accustomed to life at sea. He wrote in his diary: "The ship is plying very smoothly. I feel today better. But I am feeling separation from Sri Vrindaban and my Lords Sri Govinda, Gopinath, Radha Damodar [deities of Lord Krishna]. The only solace is Sri Chaitanya Charitamrita in which I am tasting the nectarine of Lord Chaitanya’s lila [pastimes]. I have left Bharatabhumi [India] just to execute the order of Sri Bhaktisiddhanta Saraswati in pursuance of Lord Chaitanya’s order. I have no qualification, but have taken up the risk just to carry out the order of His Divine Grace. I depend fully on Their mercy, so far away from Vrindaban." After a thirty-five-day journey from Calcutta, the Jaladuta reached Boston’s Commonwealth Pier at 5:30 A.M. on September 17, 1965. The ship stopped briefly in Boston and proceeded to New York City. After spending less than two months in Pennsylvania, Prabhupada arrived in New York's Lower East Side, where he launched his worldwide movement. Over the years, Prabhupada stayed in touch with Sumati Morarjee, mainly through letters, keeping her informed about himself and the progress of his movement. 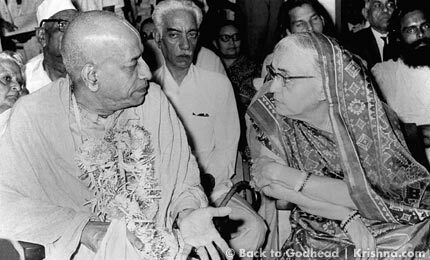 She would sometimes offer advice, and Prabhupada enjoyed corresponding with her, acknowledging her contribution in sending him West. They wrote to each other until Prabhupada's passing in November 1977. This first lady of Indian, nay world, shipping passed away on June 28, 1998, largely unwept, unhonoured and unsung. When shall we see such another like her? She was the first woman of Indian shipping and a close associate of Mahatma Gandhi, dying in Bombay on Sunday following a cardiac arrest. She was 91. Daughter-in-law of the founder of Scindia Steam Navigation, Narottam Morarjee, Sumati Morarjee held important responsibilities in the Indian and world shipping scene, which has been traditionally a male bastion. Sumati Morarjee once wrote, "It is not purely for business motives that we today concentrate on shipping. We want our people to travel abroad and the foreigners to see our ancient land. It has been the Indian tradition to export the best to foreign countries. We did business in merchandise for centuries, but our most precious cargo has been ideas of universal brotherhood and deep spirituality. . . . Our tradition of such transcendent goodwill to all has continued throughout." This was never truer than when she helped Prabhupada travel to Western shores, thus exporting to foreign countries the best India has to offer.